John Mark Comer is Pastor of the Portland, Oregon based Bridgetown Church. Comer is a very articulate, culturally savvy pastor who uses his God-given intellect to raise up a church which is comprised primarily of young people. In Portland. No small feat. Seventy percent of his congregation of over 2,000 is under the age of 35. He is an interesting and engaging writer, and God Has A Name is in the running to be one of my favorites of 2018. The layout of the book alone is somewhat unique, as it has some hand drawn artwork scattered around and there are no paragraph indentations—instead, he uses a skipped line between each of his paragraphs. And the chapters all follow a pattern as well: part 1 is unnamed but is some form of an introduction; part 2 is called “Stories”; part 3 is called “Jesus” and part 4 is titled “Us”. This pattern is repeated and forms a common thread between all of the ideas in the book. The book is at once very readable and yet also heady in some of the concepts that Comer lays out. I found it fascinating! Truly a delight to read (I finished it in 3 days), and I recommend it for you, your friends who are Christians and your friends who are not yet Christians. Get one for your Grandma, even! "The Lord [Yahweh], the Lord [Yahweh], the compassionate and gracious God, slow to anger, abounding in love and faithfulness, maintaining love to thousands, and forgiving wickedness, rebellion and sin. Yet he does not leave the guilty unpunished; he punishes the children and their children for the sin of the parents to the third and fourth generation." From the outset of the book, Comer concludes that we all end up making up a god in our heads that agrees with our own views, but that we should take a look at who God IS as He has revealed Himself, regardless of whether we would agree or not. This approach calls for some bravery, some discovery and ultimately some delight as he uncovers the true beauty of who God is and has shown Himself to be. Again, a remarkable read for any of us. 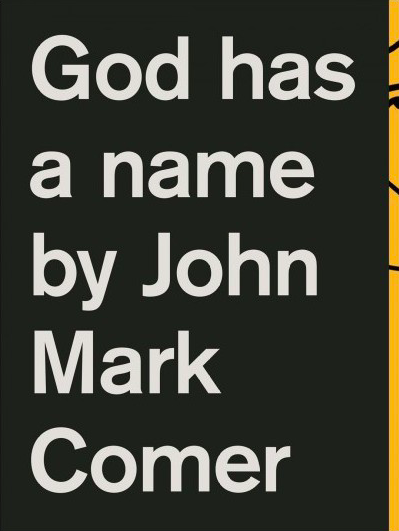 And by the way, if you have ever heard of the God of the Bible referred to as “Yahweh”, Comer explains that to us, and reveals that sure enough, God has a name. He is a Person, not a thing, and He, Yahweh, as He cares to be known, desires a relational interaction with us. I found chapter 2 alone to be worth the price of the book. Comer’s fascinating view on the spiritual world is gripping and compelling, and his scriptural back-up of his view is wonderfully laid out. You will find yourself locked in during chapter 5, which is a fresh look at the ageless problem of evil: if God is so good (read, “Compassionate and gracious” from Exodus 34), then why do bad things happen? His take on this is thorough and impressive, and feels that it would indeed make sense to us today, particularly if we were under 30, and living in progressive Portland, Oregon, or anywhere else for that matter. I recommend this book highly. You will be encouraged, and it will cause you to want to share your faith in a fresh way, because God has a Name. Thank you Pastor Comer.